Ariel Sharon and his plan to uproot the Jews of Gaza received a big boost yesterday, when the United Torah Judaism (UTJ) party formally decided to join the government. The move provides the Prime Minister with far more than just the majority in parliament that he wanted – it also enables him to say that he is presiding over a broad coalition, one that combines religious and secular representatives, rather than just a narrow sector of society. It paves the way for passage of the 2005 budget, and might also make it easier for the religious Shas party, with 10 seats, to join the government at a later stage, thereby boosting Sharon’s majority still further. Had UTJ decided against entering the coalition, it most likely would have resulted in new elections, which might have delayed, or possibly even thwarted, the disengagement from taking place in the near future, if at all. In other words, barring any unforeseen events, Sharon now has the government and the parliamentary majority he needs to move ahead with his ill-conceived plan to uproot Jews from their homes and expel them from Gaza. For opponents of the plan, the political options for halting it suddenly grew far fewer yesterday. Months of protests, demonstrations, petitions and letter-writing campaigns have thus far failed to have the desired effect. Demands for a national referendum on the Gaza plan have been met with refusal by the Prime Minister, and he seems intent on moving ahead. Where, then, does that leave us? What can each of us possibly do to stop this terrible decree from coming to pass? It may sound simplistic, and even naïve, but the answer is really very straightforward. 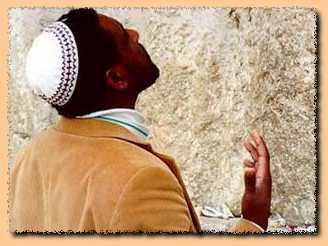 It is time for each of us to turn to G-d, and to plead for His intervention and salvation. The politicians have failed us, the parties have disappointed us, and our leadership is confused and divided. We have done our best, we have raised our voices in protest and made our opposition clear, with little or nothing to show for it. The Land of Israel is in danger, and the people of Israel are also in great peril. It is time that we turn our cries heavenward, and put our faith where it truly belongs: in the One who guides all of human destiny. Only through prayer can we avert the expulsion hanging over our people. So reach for that book of Psalms, and let those tears start to flow. We have not a moment to waste.